When it comes to pain management, acupuncture is a great way to relieve pain for temporary ailments and chronic ailments. Acupuncture for pain has been practiced in China - and beyond - for thousands of years. Pain was likely one of the core reasons to initially start using acupuncture. Its effectiveness at doing this has made it a lasting treatment in China and now around the world. Acupuncture is a system of medicine that focuses on movement of energy, called Qi (pronounced "chee"), to harmonize the body. Moving through a network of channels called meridians, Qi sometimes needs help flowing evenly. Otherwise pain and other health problems develop. Through the practice of acupuncture and Chinese Medicine, we identify areas of "Qi dysfunction" in your network of channels. This dysfunction tells us where to insert the needles into the skin to improve the flow. The needles are hair-thin, sterile, and stainless steel. How does acupuncture for pain work? There are two ways to think about how acupuncture works, the way acupuncturist view it and the way western science views it. For the acupuncture doctor the way it works is basically how it is described above. More specifically pain is seen as Qi stagnation or blood stagnation. The job of the acupuncturist is to identify which you have and use needles and other Chinese medicine techniques to get the blood or Qi moving. We know that acupuncture channels have microcurrent flowing through them similar to but not the same as nerves. When using acupucntre for pain it turns on stored neuropeptides that dull pain sensation. It also increases blood flow allowing for increased healing in the area of pain. The immune system is also activated in this healing process as it is the backbone of tissue repair. In this way, these systems work together to no only decrease the pain but acually heal the underlying problem. You can think of acupuncture like an irrigation system that irrigates dried-up areas by opening channels. You can also think of it as healing the underlying tissue damege. Just remember that the acupuncturist uses a holistic approach emphasizing harmony among the physical, mental, and spiritual aspects of your being. So the irrigation must work on all three levels to restore your body, mind, and spirit to its natural balance. Despite all of the health benefits of acupuncture, some shy away from this natural treatment because they are hesitant to entrust just anyone. It turns out there is reason to be heasitent, some providers who perform acupuncture in Scottsdale and acupuncture in Phoenix have as little as 20 hours of training. 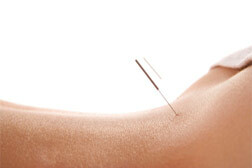 Our acupuncture doctors have received up to 3,000 hours of training in acupuncture! So if you are concerned about the quality and care of your treatment, rest assured that here at Southwest Integrative Medicine, you are in good hands. Click to find out how they work.